It is time to celebrate Goa’s unsung, slightly smelly hero of a fruit, the humble jackfruit. It would be right to mention here that this article has been inspired by the exploits of our resident Goan upholder of ‘Goenkarponn’ (Goan identity) Marius Fernandes. The Ponsachem Fest (Jackfruit Festival) organised by him and other fellow Goenkars like Miguel Braganza, Alexyz and many more on the 24th of June 2017, is but one of many festivals he has held to create a sense of cultural identity for the younger generation of Goans to hold on to. A tropical fruit, the jackfruit is scientifically known as Artocarpus heterophyllus. It is found in countries of Asia, Africa, as well as Brazil in South America and some other countries. The jackfruit is supposed to be endemic to India with archaeological findings that the fruit grew here thousands of years ago. In Goa, the fruit is known as panas, or ponas, and is generally available in two varieties: the firm type called kappa and the soft type called rassal. 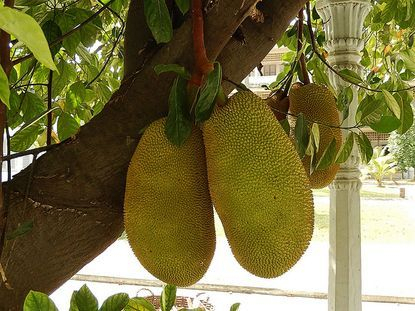 The jackfruit tree yields fruit from March to June and then from September to December. Do not be fooled by its spiny, uninviting exterior, which turns a yellowish green or brownish green when ripe. The fruit has to be cut after applying oil to your hands, the knife and plate being used. This is because the skin of the jackfruit secretes latex that is difficult to remove. The yellow bulbs of flesh within have an aroma of a mingling of strawberry, pineapple and banana with a hint of muskiness. The flesh envelopes the bulky seed of the jackfruit, which can be eaten after boiling or made into a powder that imitates the flavour of cocoa to some extent and has even been made into coffee. The wood of the tree is strong and durable, and can be used to make furniture and for construction. Apart from being eaten raw, the jackfruit can be made into jam, squash, halwa, pickle, chips, and can be used in various recipes in its ripe and unripe states. The flesh is used in place of pulled pork and other recipes involving meat to satisfy vegans. Its medicinal properties are many and the leaves, flesh and seeds are equally beneficial in moderate quantities. The fruit has almost identical nutrients to a human mother’s milk, which makes its highly nutritional. There is a lectin called jacalin found in the jackfruit and said to be beneficial in preventing colon cancer. Phytonutrients present in the fruit destroy cancer causing free radicals and minimise the aging process. High levels of vitamin C in the fruit will boost immunity. 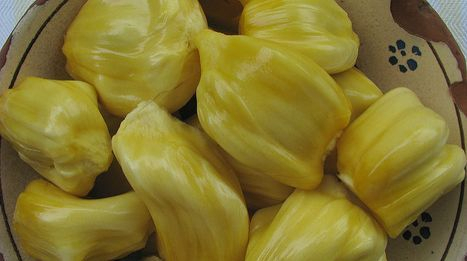 Jackfruit is good for digestion issues and helps heal stomach ulcers. The high fibre content makes it ideal for relief from constipation and also removes cancer causing chemicals from the large intestine. 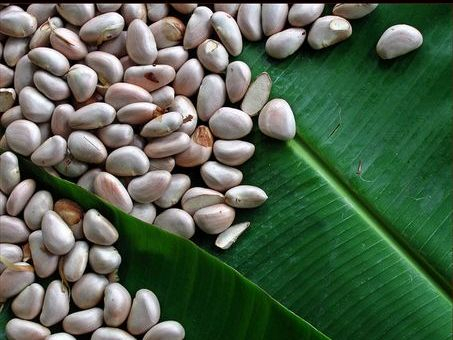 It is rich in magnesium which enables absorption of calcium and can strengthen bones. Vitamin A present in jackfruit will keep eyes and skin healthy. The extract obtained from boiling jackfruit root is supposed to be good for asthma. Its potassium content will allow the lowering of blood pressure. Latex of the fruit has antimicrobial properties. Copper in jackfruit aids the proper functioning of the thyroid gland. The fruit’s high iron levels will maintain the haemoglobin balance and prevent anaemia. Preparation: Roast the semolina till light brown and let it cool before using it. Alternately, if using parboiled rice, you need to soak the rice overnight and then grind it with ¾ cup of water to form a smooth batter. Blend separately in a mixer/grinder the jaggery and coconut into a fine mixture. Then mix the coconut-jaggery combination with either roasted semolina or batter of parboiled rice and the other ingredients well to form a cake batter. This cake is typically steamed for 20 minutes in a double boiler, but you can bake it for 30 minutes at 180oC in the oven. After the cake is ready, fry it on both sides with ghee on a frying pan and serve. Ingredients: 300 gm of jackfruit seeds, 1 grated coconut, 1 tsp of red chili powder, 3 tsp of coriander powder, 3 cloves of garlic, ½ tsp of cumin powder, ½ tsp of dry mango powder/tamarind paste, ½ tsp of turmeric, 2 small onions, 3 green chilies, a cup of chicken stock/1 Maggi cube, 2 tbsp of oil, salt to taste. Preparation: Boil the jackfruit seeds with a little salt. Remove the shells of the cooked seeds and keep the stock aside for later use. Grind the grated coconut and strain the coconut milk. Add finely chopped onions and sauté in the oil. Then add chilies (keep whole with just a small cut in the middle), red chili powder, cumin powder, turmeric powder, coriander powder and chopped garlic and mix till combined well. Add the coconut milk and keep it on a low flame to bring to a slow boil. Add the dry mango powder/tamarind paste and Maggi cube/chicken stock and jackfruit seed stock when it is boiling and keep stirring for 5 minutes. Add jackfruit seeds and let it cook for another 10-15 minutes. For wrinkles and healthy skin: Make a powder of jackfruit seeds and mix it with milk to form a paste and rub it gently into your skin. Leave it on for half an hour and wash your face. Do this every day for wrinkle-free healthy skin. For diabetes: Due to its ability to lower the glycaemic index, jackfruit seed powder/flour can be added to various dishes, chappathi mix, made into a porridge, etc. You can even eat the boiled seeds as they are as a healthy snack. Caution: If you wish to make a dietary change involving regular use of jackfruit seed powder, you must consult your doctor to balance your diabetic medication with the diet. Avoid making absolute and quick changes to your diet. Excess intake may cause hypoglycaemia and even death.